Knollwood Energy is a New Jersey based company focused on the renewable energy markets. Their email marketing system connects with their customer database to send notifications about monthly meter readings. 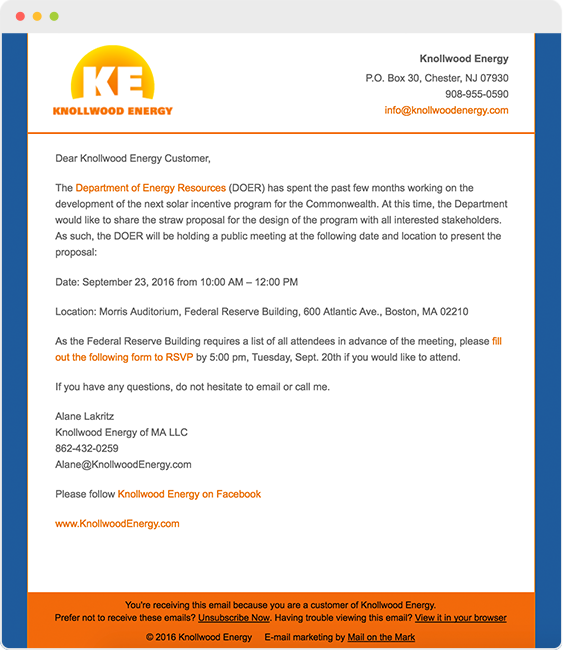 The newsletter design is simple, clean and uses Knollwood’s corporate colors. A custom-built solution allows Knollwood Energy to connect readers directly to their account. When each customer receives their email, it has a unique link that allows them to directly connect to their own customer portal. This monthly email reminds customers to enter their required monthly data. A regular email alert system is an easy way to increase customer compliance on critical actions.